For other places with the same name, see Marble Canyon (disambiguation). Marble Canyon is the section of the Colorado River canyon in northern Arizona from Lee's Ferry to the confluence with the Little Colorado River, which marks the beginning of the Grand Canyon. 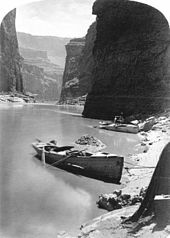 Lee's Ferry is a common launching point for river runners starting their journey through the Grand Canyon. Marble Canyon is also well known for the Navajo Bridge, where US Highway 89A crosses the Colorado River. Marble Canyon marks the western boundary of the Navajo Nation. In 1975, the former Marble Canyon National Monument, which followed the Colorado River northeast from the Grand Canyon to Lee's Ferry, was made part of Grand Canyon National Park. The name Marble Canyon is a misnomer because there is no marble there. Although John Wesley Powell knew this when he named the canyon, he thought the polished limestone looked like marble. In his words, "The limestone of the canyon is often polished, and makes a beautiful marble. Sometimes the rocks are of many colors - white, gray, pink, and purple, with saffron tints." A panoramic view of Marble Canyon from Navajo Bridge. Looking into Marble Canyon, Shinumo Altar in the distance. Marble Canyon is the only home of the endangered cactus Pediocactus bradyi. ^ Glenn Rink, Grand Canyon River Guides BQR, Life at the Marble Canyon Damsites, spring 1997. Retrieved May 16, 2007. ^ Mesa Community College, Geology Field Trip: Colorado River Archived 2006-09-07 at the Wayback Machine, Summer 2004. Retrieved May 16, 2007. ^ Pediocactus bradyi. The Nature Conservancy. This page was last edited on 3 November 2018, at 23:36 (UTC).